Entertaining Elliot: Florida Holiday 2017 ~ Day 5 - When plans go astray! Florida Holiday 2017 ~ Day 5 - When plans go astray! 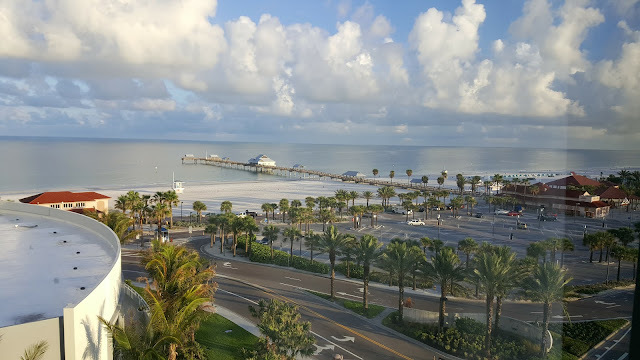 We awoke to the sunshine peeking through our curtains at Pier House 60 and were faced with glorious sunshine upon the white sandy shores of Clearwater. It certainly was a room with a view! We headed down for our breakfast (which was included in our stay) and were greeted with more stunning views, this time of the marina. Breakfast was great with loads to choose from including sausage and eggs, bagels, fruit, pastries etc. I had some amazing whipped strawberry mousse stuff on my bagel - certainly beats a bowl of cornflakes!! 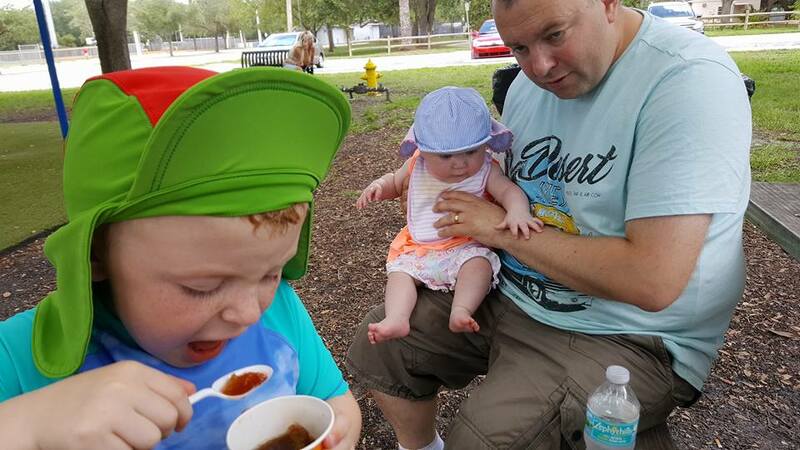 The plan today was explore the coast and we were aiming to get to Weeki Wachee Springs to see the mermaids. We never made it that far in the end but had a great day regardless! We first headed up to the town of Dunedin which is a short drive from Clearwater. 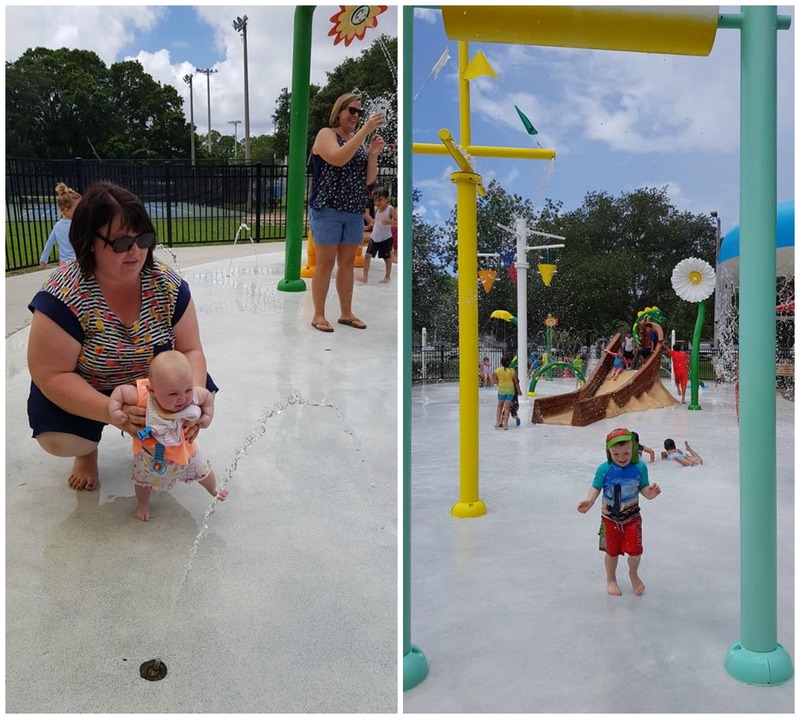 I'd heard it was a pretty little town to stop at but we were on the hunt for one thing....the splash park! We'd spotted it on the website and it was right up Elliot's street. 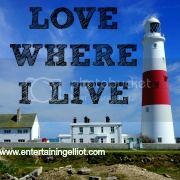 We eventually found the park and it was brilliant, loads of undercover seating, a big play park, swimming pool and of course the splash park. Elliot couldn't wait to get his swimmers on and get stuck in! 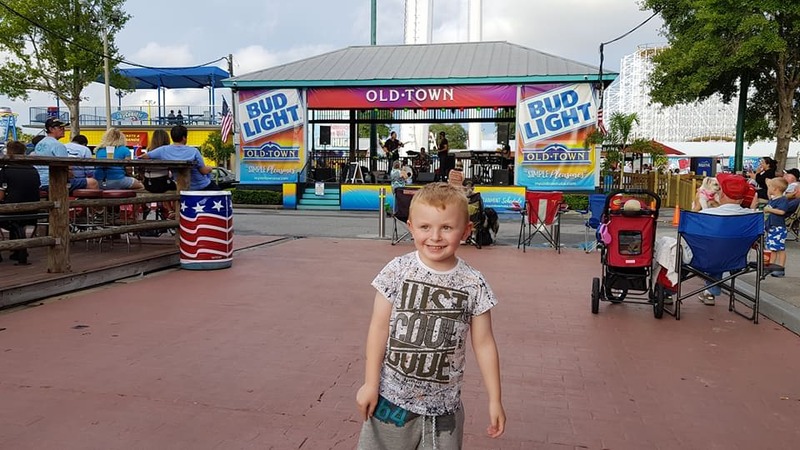 Unfortunately, about 60 seconds after he started playing we heard an alarm which turned out to be a lightning detection and they had to close the splash park as a precaution! Elliot was gutted and of course there were tears but he soon cheered up once he spotted the shaved ice truck. I've only ever seen shaved ice on telly and it's not something we get in the UK (or am I missing out on something?!). Basically you get a cup of ice flakes and you can add flavoured syrups....it's pretty similar to a slush puppy. Yummy! We went a bit mad with the flavours and ours both ended up a murky purple colour but they were delicious!! 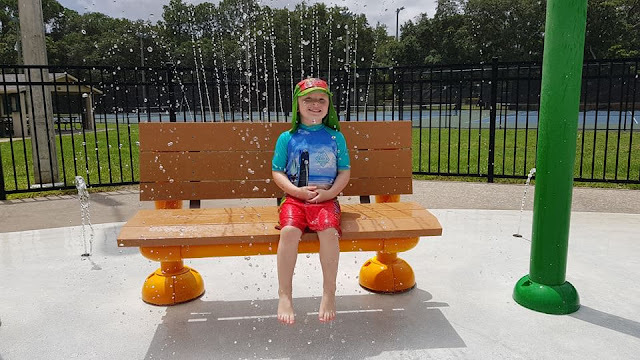 After a quick play on the slides, the splash park reopened so we hot footed it over to get a seat in the shade and Elliot went mad in the water. A little while later the heavens opened and it absolutely poured down - I've never seen rain like it! The park stayed open but we were getting so wet that we decided to call it a day and had to make a mad dash to the undercover area to dry off. Not sure who was wetter, Elliot in his trunks or us holding the towels! 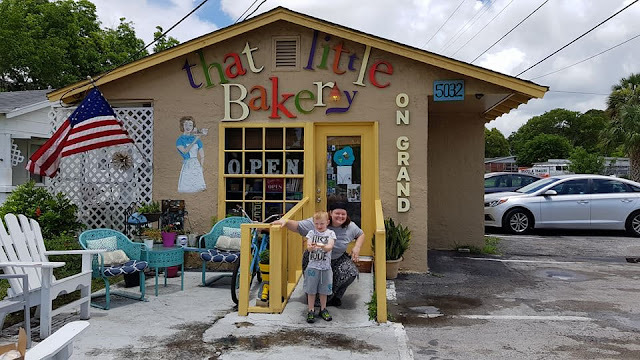 Our next visit was New Port Richey to call in on a bakery (That Little Bakery on Grand) owned by a friend of ours who moved back to the US from Dorset a little while ago. It was great to catch up and a good excuse to stop for a cake!! Time just flew by today and it was almost 3pm by this point - we did think about driving onto Weeki Wachee Springs but we were already 2 hours from Kissimmee and the kids were getting a bit grumpy about being in the car so we made a quick stop at Walmart for snacks and then started the drive back....which seemed to take forever! 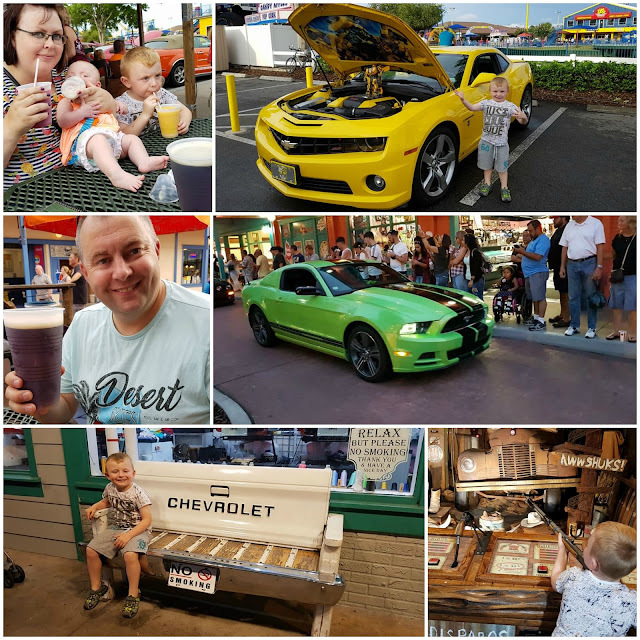 Back in Kissimmee and we headed down to the Old Town to check out the car show. We watched the cars do a lap of the Old Town and decided to call it a day as it was way past bedtime for the little ones. Paul had had some beers so it was my turn to get behind the wheel - gulp, my first time driving this holiday. Luckily I didn't have to drive far but it wasn't too bad!